Icing On The Ring is a successful wedding band and engagement ring retailer based in the Los Angeles Jewelry District. Although they had consistent sales and success in their brick-and-mortar store, they were looking to improve their online performance and increase their ROI by building a store on the BigCommerce platform that could rival what they had on Magento. 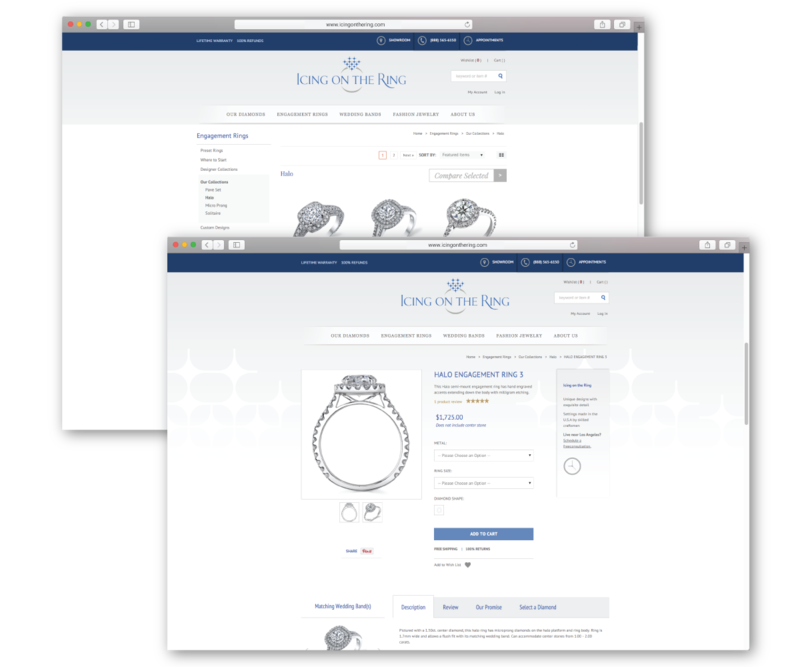 EYEMAGINE improved Icing On The Ring’s web presence by optimizing their SEO, starting new email marketing campaigns and, most prominently, by putting their website on the BigCommerce platform. The latter task involved transferring their existing Magento designs— created through Mosaic design company— into BigCommerce’s template-based system. From an implementation perspective, this was a considerable challenge. Bigcommerce and Magento work very differently as platforms. Bigcommerce is a front-end focused, template-based system, meaning that users simply purchase a template and essentially fill in the blanks with their desired content. Magento, on the other hand, is more back-end focused, allowing developers to modify the back-end to fit their needs, creating their own templates and design as they go. It’s like drawing in a coloring book versus in a blank notebook— the first has the bare bones laid out, while the second is quite literally a blank slate. As a result, trying to fit Magento designs into the BigCommerce molds required a great deal of time, skill and customization. However, it was worth the effort, since BigCommerce has many features that perfectly suit Icing on the Ring’s needs. BigCommerce is a fast, user-friendly, robust eCommerce website platform. Click here to get more information on BigCommerce now. Its template-based structure makes BigCommerce an extremely user-friendly platform, both for Icing On The Ring and for its customers. From the customer's perspective, it provides a clean, easy-to-navigate design that allows them to quickly understand the company’s brand, what it has to offer, and where to find exactly what they’re looking for. The templates make site maintenance and improvements easy to do for Icing On The Ring, allowing the company to upload new products, configure gateways, do product updates and make any other necessary changes easily and effectively. This kind of automation is extremely helpful for any eCommerce retailer, as it allows them to take full control of their website and keep it as up-to-date as possible without having to hire extra developers to do so. Finally, as a hosted application, BigCommerce is a very cost-effective platform choice, allowing Icing On The Ring to save some money along the way. It’s a win-win when the site is properly configured. Now let’s get into some more detail. One of the biggest challenges was finding a BigCommerce theme that would support the functionality that Icing on the Ring needed on their site. The company has an extremely complex range of products with various categories and subcategories: first, there are the main categories of engagement rings, wedding bands and fashion jewelry. Under each of these, there are further sublevels based on features like brand and style. Next, when a specific ring is chosen, it is filtered based on price, diamond shape, metal and size. Finding a theme that properly filtered, displayed and organized these products was quite the hurdle. Why? BigCommerce themes are all user-friendly and sophisticated, which means that it can be easy to select a theme that seems perfect but ultimately does not support a specific advanced functionality. This was a trial-and-error experience for EYEMAGINE, but our developers ultimately found a theme that worked with the company’s aesthetic and supported their Magento-based features and designs. To avoid having to migrate between multiple themes, make sure that you understand the functionality that you need ahead of time and filter the themes based on responsiveness, style editor capabilities, or product filter. Once EYEMAGINE found a theme that supported this advanced filtering functionality, the team focused on designing the company’s “big 5”: their homepage, product page, category list, search page and cart & checkout. These are the main pages of any eCommerce site, so having them properly designed and integrated is always key. From there, we built custom landing pages for each ring category and brand. This was an important part of solidifying their brand identity and the high-end aesthetic of the site without losing the individuality of each ring style and brand. We also used “custom field” widgets to do a small amount of coding and customize the product pages, allowing for grid view and list view, and adding key features like price points, a “wishlist” and “compare rings.” While many of these features are available out-of-the-box with Magento, they have to be custom-built on BigCommerce, which requires a great deal of time and technical expertise. The side banner, in particular, was created to populate dynamically: while someone viewing a ring from the Icing on the Ring collection will see a banner from their store, someone viewing a ring from the brand Makur would see a banner from that company instead. Finally, we made sure that each page of the site had a custom slider on the bottom with similar products. These sliders change on the home level, the collection level and the product level, allowing each company that collaborates with Icing on the Ring to display the feature products that they want their customers to see. 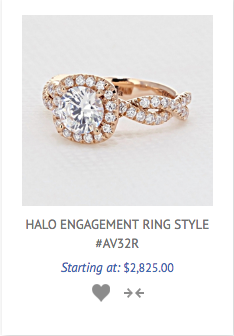 Someone viewing a “halo” style engagement ring, for example, would see only halo styles in the slider on that product page. 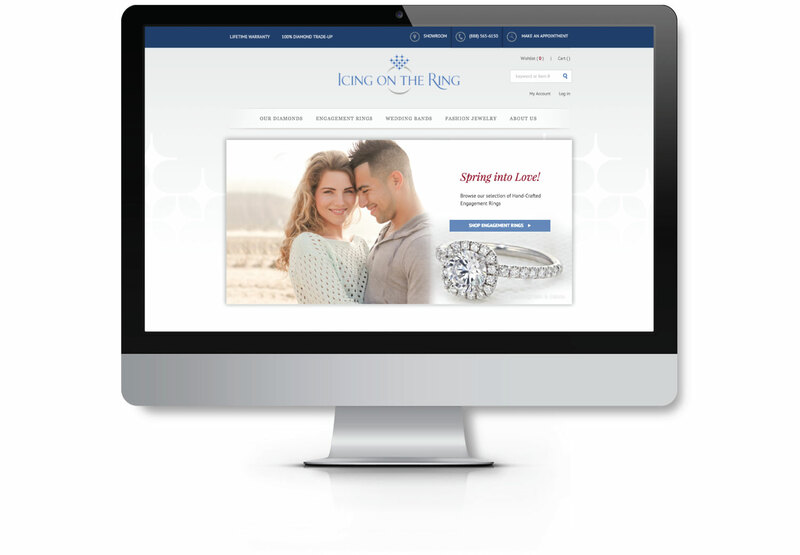 EYEMAGINE worked to refine the marketing strategies and create a new BigCommerce website for L.A.-based jewelry retailer Icing on the Ring, implementing custom features that optimized their site and helped boost their revenue & conversion rates.